Thank God for U.S. Senator Rand Paul (R-KY). At least there is one politician in the United States Senate who is concerned about deficit spending. On Thursday night, he led a lonely crusade against a two-year $400 billion spending bill that balloons the budget and massively increases the federal debt by over $1 trillion. Paul continued the fight for hours, forcing a very brief government shutdown, and providing much needed attention to the spending habits of our federal government. 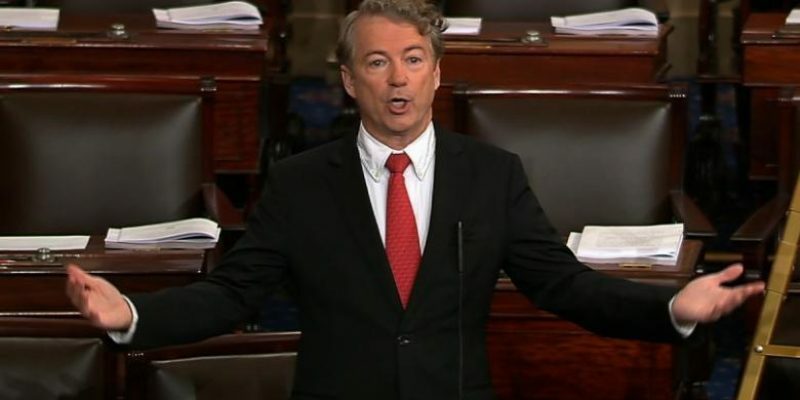 On the Senate floor, Paul, revealed the real problem was “Republicans hand-in-hand with Democrats offering us trillion-dollar deficits.” He said that the goal of the protest was for “people to feel uncomfortable” supporting such a huge spending bill. Senator Paul implored his colleagues to maintain the current budget caps and not support a “700-page bill that no one has read, that was printed at midnight.” Instead the Senate overwhelmingly passed the legislative package by a vote of 78-21 at 1:30 a.m. ET. Hours later, the House passed it by a vote of 240-186. This horrible deal was strongly supported by House Speaker Paul Ryan (R-WI) and Senate Majority Leader Mitch McConnell (R-KY). While the President signed the bill, he did not express the same enthusiasm for the increased spending as the congressional leaders. Trump only supported the package because it included $165 billion in additional military spending that is undoubtedly needed. Otherwise, he realized the problems with the deal. The President tweeted that “we were forced to increase spending on things we do not like or want.” He said it included “much waste” to secure needed votes from congressional Democrats. In exchange for the increase in military spending, Congress agreed to an additional $131 billion in domestic spending. As a result of this bill, the budget caps instituted in 2011 are history and there will be $300 billion in new military and domestic spending and $100 billion in “emergency” spending to provide relief to victims of recent hurricanes and natural disasters. Even though there is a Republican President and Republican leadership in both houses of Congress, there has been no change in the “tax and spend” policies in our nation’s capital. This will undoubtedly anger many conservative voters throughout the nation who worked tirelessly to give Republicans control of the House in 2010 and the Senate in 2014. Republicans were not put in charge of Congress to keep the same policies in place. The GOP was given the reigns of leadership to institute needed reforms and make critical changes to the “politics as usual” system that created so many problems in our country. Sadly, the “deep state” forces within the bureaucracy make any sort of real change especially difficult, if not impossible. With such consequential mid-term elections later this year, the stakes for the Republican Party could not be higher. If the base of the GOP feels betrayed by this budget vote and stays home for the mid-term elections, the result for the Republican Party will be catastrophic. If the GOP grassroots are not motivated, the Republicans will surely lose control of the House and radical leftist Nancy Pelosi (D-CA) will become the Speaker once again. This means a far-left agenda and probably a vote to impeach President Trump next year. Consequently, it is incomprehensible that such a bloated budget bill was endorsed by GOP leadership. Congratulations to Senator Paul, Congressman Meadows and the very few conservatives who stood tall and voted against this bill. Their valiant effort highlighted the hypocrisy of GOP congressional leaders who campaign as conservatives but govern as liberals. If this continues in the months ahead, Republicans can kiss control of Congress goodbye.